Little clapping boy, and a week till he's 1!! Duncan wasn't clapping while other children his age were, I became paranoid about this , and started to question every single silly thing... within a week he was! And now he does it all the time which is very cute. This made me realise even more so, that every child is so different, and what one might be doing at 11 months, the other may take another month to master it! So black mark for me, for becoming 'one' of those paranoid mummies!! Duncan has 8 teeth, and hopefully having a little break from them coming in, as he has been so unhappy with them for ages! He has become funny with his food recently, and is trying to gain some independence on the feeding front. 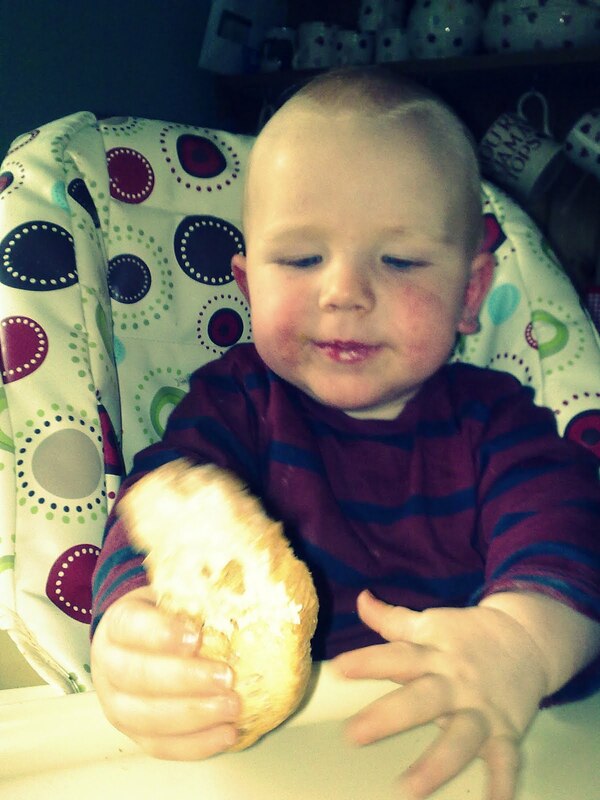 He can't feed himself with a spoon, but will happily finger food almost anything. Bread sticks and homous are a favourite, closely followed by raspberries, blueberries and strawberries, but his staple diet does seem to be petit filous!! 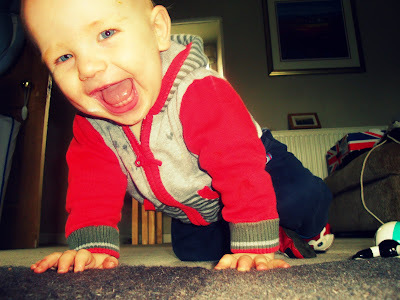 He is such a smiler at the moment, and really knows how to work a room! He is so busy staring at people, trying to catch their attention, just so he can give them a big smile! He is having a little birthday party tomorrow, with his little pals from playgroup. 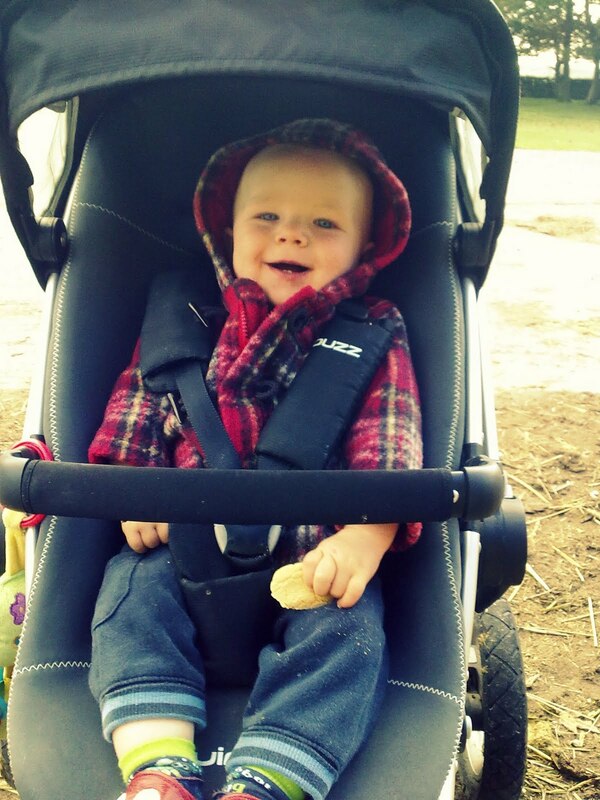 Here is a photo of him on his new trike. 1 week before his birthday. Crawling has quickened, and he is pulling himself up onto everything. He may be walking before Christmas? But he has a nice new pair of shoes to help on his way! That is him over 10 months now. He has developed so much in the last month. We had our first cold around 9 months, and it was a nightmare..but we got over it. He is now 'talking' ...not proper talking, more garble...but it is very cute, and we think dada might be one of the words! He is still not too keen on lumpy food, but is trying to feed himself!So I will need to look into more finger food ideas!We have 6 teeth, and maybe 2 coming in next to his top front ones, but nothing broken through yet!He is starting to love books, and enjoys bedtime stories now which is nice. Mealtimes have been a nightmare of recent. He has been eating nothing I give him, which is becoming very frustrating. His teeth must be so sore, yogurt seems to be the only soothing thing! I tried him with a bit of hummus and bruchetta...and it was a big hit. So when he starts fussing, I have been just giving him a that to chew on untill he calms down!!! 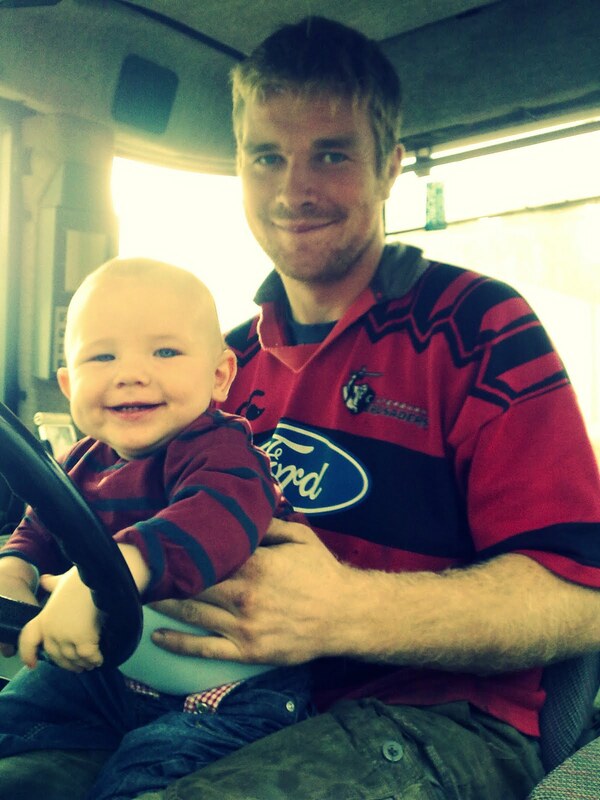 A very happy wee man yesterday when he got to sit on his daddies knee in the tractor! On the move..proper crawling, and cruising! Crawling one day, then an expert at it the next!! I can't believe how fast, and mobile he is becoming...and he is constantly pulling himself up onto things...stairs (luckily just 1st step!) (stair gate getting fitted asap!) sofa and boxes!! His 2 front teeth are looking huge as they travel down his gum too. Poor wee man! Its been an eventful week for baby D. He has started crawling!!! He has just passed the 9 month milestone, and turned swimming across the floor into proper crawling! He is still a little frustrated, but is managing to get form A to B...I'm sure as the days pass, his crawl will become much faster. He has also started pulling himself up onto furniture...really, anything that he can grab! He has 4 bottom teeth, and 2 big top ones just cutting through! They are unfortunately giving him a bit of grief, and he has been waking through the night, and is a little off his food. His nappies have been violent with these 2 top teeth too! 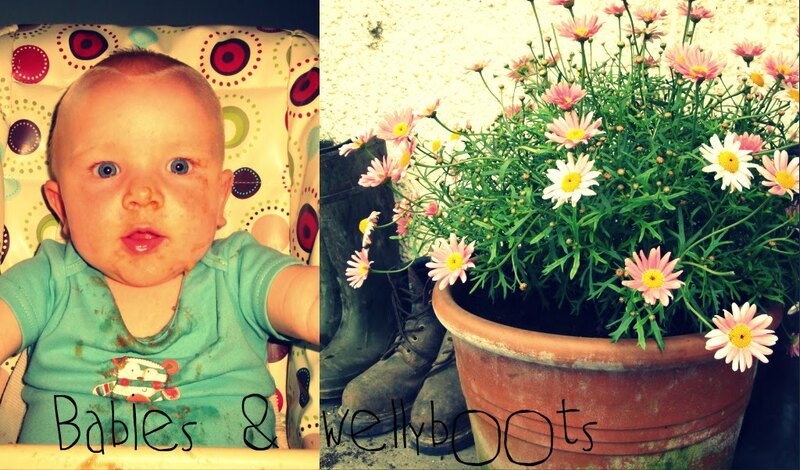 He is so active at the moment, and a simple nappy change turns into a huge wressle! !It is impossible to keep him still, and in one place. Bathtime has turned into an energetic event, and a simple wash and splash about, turns into a rather exciting gymnastics session!! He crawls about the bath, determined to grab the taps, the plug chain, as well as stand up...all at great speed! 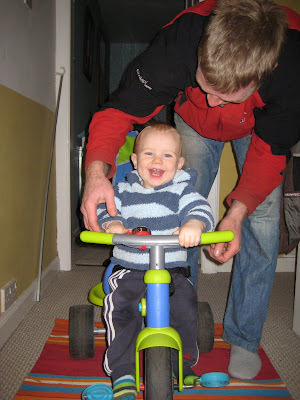 Duncan's new name is Mr Wriggler....continuously moving about, and it is becoming impossible to change a nappy! He is so close to crawling, and shuffles everywhere! He is 9 months in a few days!He still has 3 teeth, but i think the top ones are giving him aggro. 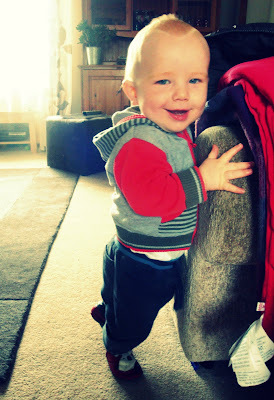 He has started to pull himself up onto things, as well as standing up in his cot!! This morning he was facing the other way in his cot...so I don't know what went on last night...lots of moving I'm sure. Jock continues to make him laugh uncontrollably which is lovely to watch!